Draft: 2007, Pittsburgh Pirates, 9th rd. 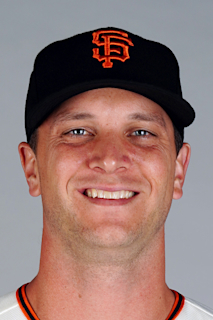 Was one of the Giants' top relievers, posting a 4-6 record with a 2.59 ERA (19er, 66.0ip) in 72 games...His 32 holds were tied for third in the Majors, while his 72 games were tied for the 12th-most in the NL...Had his 19-inning scoreless streak snapped July 11 vs. Chicago-NL after allowing a solo homer to Javier Báez... it also marked his first run allowed at home in 2018, snapping his home scoreless streak at 20.2 innings, which had been the second-longest home scoreless streak by a Giants reliever (Felix Rodriguez, 21.0ip in 2001-02)...Went 2-2 with a 1.50 ERA (7er, 42.0ip) and a 0.90 WHIP over his first 42 games with SF, compared to a 2-4 record with a 4.50 ERA (12er, 24.0ip) and a 1.25 WHIP over his final 30 games...His six losses were tied for the third-most among relievers in the National League...In 32 games against the NL West he posted a 1.16 ERA (4er, 31.0ip) and a .202 opponents average...Posted a 1.36 ERA (5er, 33.0ip) at home, compared to a 3.82 ERA (14er, 33.0ip) on the road...Is the only reliever in the Majors to pitch in at least 70 games each of the past four seasons (2015-present). Combined to make 71 appearances (66.2ip) for the Pirates and Dodgers, going 7-4 with a 3.38 ERA (25er, 66.2ip) and ten saves...Began season as the Pirates closer and converted each of his first seven save opportunities...later lost the closer job after he suffered blown saves on back-to-back days in Baltimore on June 6-7...Was traded to Los Angeles-NL on July 31 in exchange for RHP Angel German and IF O'Neil Cruz...In 24 appearances for Los Angeles-NL, he went 2-1 with a 2.70 ERA (6er, 19.0ip) and held batters to a .208 average. Began season as the left-handed setup man to closer Mark Melancon and finished the season as the team's closer after Melancon was traded to Washington on 7/30...Made season debut on Opening Day and struck out two of the three St. Louis batters he faced on 4/3...Had a sacrifice bunt on 4/22...Recorded his 300th career strikeout on 5/8 at St. Louis...Was on the Paternity List from 5/25-27 as wife Cassie gave birth to son Theodore on 5/25...Made 11 straight scoreless appearances (11.0ip/2h) from 4/29 thru 5/28...Gave up a hit and a run on 6/1 at Miami and suffered the loss; was his first hit allowed since 5/6... Surrendered four runs in 0.1ip on 6/4 vs. Los Angeles...Had his seasonhigh 14.0-inning scoreless streak snapped on 7/10 after allowing one run and being charged with his third loss...Took over the role of the closer after Mark Melancon was traded on 7/30...Picked up his first save on 8/2 at Atlanta and also establishd club record for most career strikeouts by a LH reliever (327)...Posted a 0.42 ERA (21.1ip/1er) in 22 appearances between 6/7 and 8/2...Suffered a blown save, but picked up the win, in second save situation on 8/5 vs. Cincinnati...Struck out the only batter he faced on three pitches while picking up his fourth save on 8/11 vs. San Diego...Tied club record with 10 saves during the month of August (also Melancon in 2015) and ranked second among National League pitchers for the month (Aroldis Chapman had 11)...Suffered blown save on 8/29 at Chicago; gave up a one-out solo homer to Jorge Soler in the ninth inning...Went a week without pitching before tossing a scoreless frame in a non-save situation on 9/5 vs. St. Louis...Surrendered four runs (three home runs) and suffered blown save on 9/6 vs. St. Louis; gave up gametying homer to Matt Carpenter on an 0-2 pitch with two outs before allowing three more runs to score...Rebounded with a save the following night - retiring Carpenter for the final out in a 4-3 victory...Appeared in his 400th career game on 9/20 at Milwaukee, becoming just the eighth pitcher to make 400 or more appearances in a Pittsburgh uniform; the only other left-handed pitcher with more games than Watson is Wilbur Cooper, who made 469 appearances (368 starts) with Pittsburgh between 1912 and 1924...Converted each of his last five save chances. Produced a 0.64 ERA (42.0ip/3er) in 43 games at PNC Park; was scored upon in just three outings...Was a member of Pittsburgh's Opening Day roster for the fourth straight season...Surrendered a threerun homer to Todd Frazier in the eighth inning on Opening Day and suffered a 5-2 loss...Was scored upon just once in his next 25 games (27.0ip/1er - 0.33 ERA) thru 5/30...Threw 30 pitches while recording his fifth career save (third career 2.0-inning save) on 4/22 vs. Chicago (NL)...Picked up first win on 4/25 at Arizona...Made 17 straight scoreless appearances (19.0ip) from 4/22 thru 5/30...Struck out three consecutive pinch hitters on 5/30 at San Diego - the first Pittsburgh pitcher since Goose Gossage on 6/22/77 vs. San Diego to whiff three straight pinch hitters...Appeared in 300th career game on 7/20 at Kansas City - just the sixth lefthander in club history to make at least 300 appearances... Was scored upon just once in his last 30 appearances (29.2ip/2er - 0.61 ERA), dating back to 7/31. 2015 POSTSEASON: Tossed a scoreless seventh inning in the Wild Card Game vs. Chicago on 10/7. Spent third straight full season in the Majors and established career highs in appearances, wins, innings pitched and strikeouts...Was selected to his first National League All-Star Team; threw one pitch in the All-Star Game and retired Jose Abreau on a flyout to left field...Led all National League left-handed relief pitchers in ERA (1.63)...Shared Major League lead for most games by a left-handed relief pitcher (also Milwaukee's Will Smith)...His 10 wins were the most by a Pittsburgh relief pitcher since Jeff Robinson went 11-5 in 1988...Went 5-0 with a 0.91 ERA (39.2ip/4er) in 40 games at PNC Park; was unscored upon in his last 15 home games (14.1ip), dating back to 8/6...His 78 appearances tied Scott Sauerbeck's club record (2002) for a left-handed reliever...Posted a 0.95 ERA (28.1ip/5r/3er) in 27 day games...Held left-handed batters to a .179 (14-for-78) average...Was a member of Pittsburgh's Opening Day roster for the third straight season...Picked up wins in back-to-back outings on 4/6 vs. St. Louis and 4/8 at Chicago (NL)...Won his third game on 5/6 vs. San Francisco...Won his fourth decision without a loss on 5/14 at Milwaukee...Pitched 21.2 consecutive scoreless innings over 21 appearances from 4/24 thru 6/12; the longest such streak by a Pittsburgh pitcher since Charlie Morton tossed 24.0 in 2011...Singled off Carlos Torres for first Major League hit on 5/26 at New York (NL); also picked up his fifth win of the season on 5/26...Had a 3-0 record and did not allow a run in 13 games (13.2ip/17so) during the month of May...Did not surrender a hit in nine games between 5/26 and 6/12 (8.2ip)...Suffered a blown save on 6/15 at Miami; entered game with 2-0 score in the eighth inning and gave up two unearned runs...Surrendered five hits and three runs after two outs and suffered a blown save and a loss on 7/11 at Cincinnati...Served up game-tying home run to Adam LaRoche on 8/16 at Washington - the first home run allowed to a left-handed batter in a regular season game since 6/13/12 (Chris Davis)...Notched 10th victory on 8/29 vs. Cincinnati...Made 18 straight appearances (18.1ip) without being charged with a run from 8/20 thru 9/27...Picked up his third career save in 1-0 win vs. Milwaukee on 9/21...Recorded second save in his next outing on 9/23 at Atlanta as the Pirates clinched a postseason berth...Suffered loss in final regular season appearance on 9/28 at Cincinnati (0.1ip/2er)...Went 1-for-3 as a batter...Was named the winner of the "Steve Blass Award" as voted upon by the local chapter of the BBWAA; created in 2012, the award goes to the top pitcher on the team...Was on the postseason roster, but did not pitch in the Wild Card Game vs. San Francisco on 10/1. 2013 SEASON: Spent second straight full season in the Major Leagues and ranked sixth among N.L. left-handed relief pithcers in ERA...Set career highs in innings pitched and strikeouts...Made 21 consecutive scoreless appearances (20.1ip) to end the season, dating back to 8/6...Was charged with a run just three times in his last 42 games (44.1ip/5er - 1.02 ERA), dating back to 6/4...Did not issue a base on balls in his final 26 appearancces (25.0ip)...Posted a 1.00 ERA (18.0ip/2er) in the eight games in which he pitched 2.0 innings or more...Held right-handed batters to a .192 (30-for-156) average and left-handed batters to a .206 (21-for-102) average...Surrendered all five of his home runs during the regular season to right-handed hitters; gave up last homer on 7/7 at Wrigley Field...Made season debut on 4/3 vs. Chicago and tossed 1.1 scoreless innings; also had a sacrifice bunt as a batter...Pitched final 2.0 innings on 4/25 at Philadelphia and picked up first big league save in a 6-4 victory...Surrendered three-run homer in 0.1ip on 4/30 at Milwaukee...Suffered first loss on 5/4 vs. Washington...Was scored upon in six straight appearances from 4/30 thru 5/13 (5.2ip/8er)...Walked a career-high three batters on 6/4 at Atlanta...Retired all six batters he faced while earning second career save on 6/20 at Cincinnati...Surrendered a solo home run to Scott Hairston at Wrigley Field on 7/6, snapping an 11.1-inning scoreless streak...Pitched 2.0 scoreless frames while winning his third game on 7/31 vs. St. Louis...Gave up final regular season runs on 8/3 vs. Colorado (0.1ip/2r)...Tied career high with 3.0 scoreless innings on 8/15 vs. St. Louis...Allowed six of his 27 inherited runners to score and went 2-for-4 in save situations...Went 0-for-1 with two sac bunts in his three plate appearances; struck out on 6/30 vs. Milwaukee...Posted a 0.69 ERA (26.0ip/2er) and a .189 batting average against in 28 appearances after the All-Star break. 2013 POSTSEASON: Surrendered a solo homer to Shin-Soo Choo in the Wild Card Game on 10/1- was the only home run he gave up to a left-handed batter all season...Made three scoreless appearances (3.0ip) against St. Louis in the Division Series. Spent first full season in the Major Leagues and led Pittsburgh in appearances...Also inherited a team-high 61 runners (11 scored); second only to Los Angeles' Randy Choate (66) among National League relievers...Posted a 1.93 ERA (23.1ip/5er) and held opposing batters to a .160 average (13-for-81) in 32 games at PNC Park...Held all opposing hitters to a .198 (37-for-187) average, with lefties hitting .183 (17-for-93) and righties hitting .213 (20-for-94)...Won each of his first four decisions before suffering first loss on 7/13 at Milwaukee - gave up season-high three hits and four runs in that game...Went 12 games (8.2ip) without being charged with a run between 8/15 and 9/12...Recorded a 1.71 ERA (26.1ip/5er) in his final 31 appearances after giving up four runs in 1.0ip on 7/14 at Milwaukee...Finished season making six straight scoreless outings (5.2ip)...Struck out in lone plate appearance on 8/1 at Chicago. Began season with Triple-A Indianapolis...Posted a 2.70 ERA(13.1ip/4er) in nine games in April and a 1.88 ERA (14.1ip/3er) in 11 games in May...Losthis first two decisions before notching his two wins in back-to-back outings on 5/28 and5/30...Had a 2.45 ERA and held opposing hitters to a .179 average in 22 games thru 6/5...Was recalled by Pittsburgh on 6/7 and made Major League debut on 6/8 vs. Arizona; entered1-1 game with two runners on and one out in the 8th inning and struck out Chris Young andJuan Miranda...Gave up just one hit and no runs in his first five big league games (4.2ip)and one run in his first 10 games (9.2ip) thru 6/25...Gave up back-to-back home runs to theonly two batters he faced at Toronto on 6/28...Suffered blown save and first big league losson 7/2 at Washington (game two)...Pitched 2.2 scoreless innings on 7/18 vs. Cincinnati anda career-high 3.0 scoreless frames in his next game on 7/23 vs. St. Louis...Struck out in only plate appearance on 7/29 at Philadelphia...Suffered second loss on 7/31 at Philadelphia...Was scored upon in three straight appearances from 7/31 thru 8/5 (4.1ip/4er) and wasoptioned to Triple-A on 8/6...Went 1-0 with a 1.80 ERA (5.0ip/1er) in four games with Indianapolis before being recalled by Pittsburgh afinal time on 8/20...Tossed a scoreless inning vs. Cincinnati on 8/20 and picked up his first Major League victory...Was scored upon in hisnext three games (3.0ip/8er), raising his season ERA from 2.63 to 4.75...Was scored upon just once in his last 12 games (8.0ip/4h/1r/8so)and twice in 13 games in September (9.2ip/2er)...Threw one pitch and picked up his second big league win on 9/7 vs. Houston...Was scoredupon just 11 times in his 43 big league appearances; seven of those times coming in a nine-game stretch from 7/31 to 9/4...Allowed fiveof his 27 inherited runners to score while pitching with the Pirates. Was used primarily as a relief pitcher for the first time in his career...Posted a 1.84 ERA (63.2ip/13er) and held opposinghitters to a .173 average (39-for-225) in his 25 relief appearances...Allowed the fewest amount of baserunners/per 9.0ip for any relieverin the Eastern League (7.8)...Also went 3-4 with a 3.78 ERA while making nine starts to end the regular season...Pitched 2.0 hitless inningsof relief in his first outing on 4/9 vs. Harrisburg and followed that up with 3.0 hitless frames on 4/12 vs. Richmond...Picked up first victory infourth game on 4/21 at Akron...Earned first pro save on 5/30 vs. Reading...Tossed 2.0 scoreless frames and struck out five of the seven battershe faced while picking up second save on 6/24 vs. Portland...Was charged with just three earned runs in last 10 relief appearances(27.1ip - 0.99 ERA) from 6/12 thru 7/20, dropping season ERA from 2.48 to 1.84...Tossed 10.1 scoreless frames from 7/10-20...Received ano-decision in first start on 7/25 vs. Trenton (3.0ip/4er) before suffering loss in second start on 7/30 at Richmond (4.2ip/6er)...Pitched 6.0scoreless frames and picked up first win as a starter on 8/5 vs. Akron...Won back-to-back starts while tossing 13.0 scoreless innings on 8/22at Binghamton (6.0ip) and 8/27 vs. Richmond (7.0ip)...Lost his last two regular season starts...Was the winning pitcher in both decidinggames (Game Four's) in the Eastern League playoffs...Was the starter and winner at Trenton on 9/18 in the deciding championship game; alsostruck out career-high 10 batters. Was Altoona's Opening Day starter and received a no-decision on 4/8 at Erie (3.2ip/5er)...Lasted just 0.2 innings in his second startwhile giving up four runs in a loss at Akron on 4/15...Made three more starts (last one coming on 5/2 vs. Erie) before being placed on the StateCollege (A) roster on 4/23, where he was transferred to the Altoona disabled list on 5/5 (retroactive to 5/2) with left elbow tendinitis...Missedremainder of the regular season...Made 11 relief appearances with Scottsdale during the Arizona Fall League and posted a 2.13 ERA (12.2ip/3er). Spent entire season with Lynchburg...Led Carolina League in innings pitched and ranked sixth in ERA...Also ranked second amongBucco farmhands in strikeouts, third in ERA and tied for third in wins...Limited left-handed hitters to a .214 average...Lost his first three decisionsbefore winning three straight starts between 4/25 and 5/5...Tossed 7.0 no-hit innings and struck out season-high eight batters in winat Potomac on 7/19...Pitched 6.0 scoreless frames, but received s no-decision on 8/9 vs. Myrtle Beach...Won his final two starts, giving up atotal of two runs (one earned) in 14.0 innings of work...Posted a 2.90 ERA in his last 12 starts. Was selected by Pittsburgh in the ninth round of the First-Year Player Draft and went 7-2 with a 2.79 ERA in 13 combined starts betweenState College and Hickory (A)...Was named to the New York-Penn League All-Star team...Made professional debut on 6/21 and tossed5.0 hitless innings at Williamsport while striking out a season-high nine batters in a no-decision...Won six straight starts from 6/26 thru 7/25and posted a 1.46 ERA (33.2ip/7er) during the stretch...Suffered lone loss with State College on 7/30 at Mahoning Valley despite giving up justtwo runs in 5.0ip...Tossed 5.0 scoreless frames in final start with Spikes on 8/19 at Tri-City...Was promoted to Hickory on 8/22 and made finalthree starts with Crawdads...Suffered loss in first start on 8/23 at Greensboro (4.0ip/5er)...Tossed 6.0 scoreless innings while winning his secondstart on 8/28 vs. Asheville. February 19, 2018 San Francisco Giants signed free agent LHP Tony Watson. November 2, 2017 LHP Tony Watson elected free agency. August 1, 2017 Los Angeles Dodgers activated LHP Tony Watson. July 31, 2017 Pittsburgh Pirates traded LHP Tony Watson to Los Angeles Dodgers for RHP Angel German and 3B Oneil Cruz. May 28, 2016 Pittsburgh Pirates activated LHP Tony Watson from the paternity list. May 25, 2016 Pittsburgh Pirates placed LHP Tony Watson on the paternity list. August 20, 2011 Pittsburgh Pirates recalled Tony Watson from Indianapolis Indians. August 6, 2011 Pittsburgh Pirates optioned Tony Watson to Indianapolis Indians. June 7, 2011 Pittsburgh Pirates recalled Tony Watson from Indianapolis Indians. March 14, 2011 Pittsburgh Pirates optioned Tony Watson to Indianapolis Indians. November 19, 2010 Pittsburgh Pirates selected the contract of Tony Watson from Altoona Curve. September 11, 2009 Tony Watson roster status changed by Altoona Curve. May 5, 2009 Tony Watson assigned to Altoona Curve from State College Spikes. May 5, 2009 Altoona Curve placed LHP Tony Watson on the 7-day disabled list. May 5, 2009 Tony Watson roster status changed by Altoona Curve. May 3, 2009 Tony Watson assigned to State College Spikes from Altoona Curve. April 26, 2009 Tony Watson assigned to Altoona Curve from State College Spikes. April 23, 2009 Tony Watson assigned to State College Spikes from Altoona Curve.